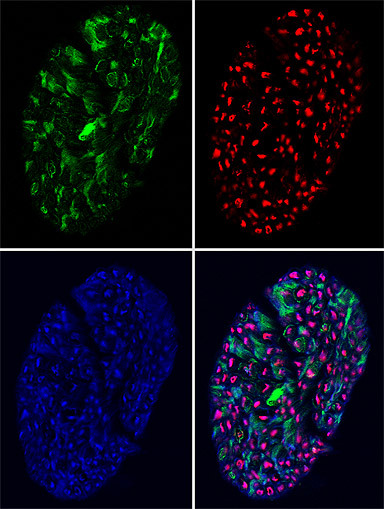 Rat sciatic nerve fibers were fixed, sliced cross-sectionally, and stained with phalloidin (green) for actin filaments as well as with antibodies for tubulin (blue), and neurofilament (red). I study how axon-targeted syntaphilin (SNPH) docks mitochondria in axons. To explore potential docking sites for SNPH, I examine the distribution of the cytoskeleton in axons using multicolor fluorescence. These images show the localization of actin filaments, microtubules, and neurofilaments within axons. I use the LSM 510 Meta, which can visualize multiple fluorophores and allows me to examine the distribution of different proteins within my cross sections.